Transitional training with the Sikorsky H-19. The Sikorsky H-19 and its subsequent variants were workhorse utility helicopters for all branches of the U.S. military and many allied forces in the 1950s & 60s, playing prominent roles in conflicts from Korea through the Vietnam War and in many civilian rescue operations. It was also built under license in Britain as the Westland Whirlwind, by Mitsubishi in Japan and by the SNCASE in France. Originally developed by Sikorsky in 1949, it's innovative design placed the engine below and up front of the pilot in the nose. This freed up a large cargo cabin space and allowed easy access for engine maintenance or replacement. Locating the engine forward allowed the main cabin to be located in line with the main rotor's rotational axis and close to the aircraft center of gravity, making it easier to maintain weight and balance under differing load conditions. 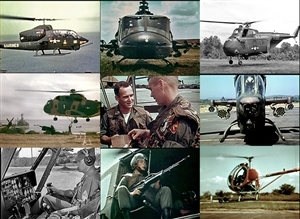 This film, featuring the H-19D was produced by the U.S. Army at the Aviation Center at Fort Rucker Alabama, and was designed to help pilots transition from the light weight H-13 recon helicopter, which was often used in training. The film covers eight steps: Pre-flight Inspection, Cockpit Procedures, Taxiing, Hovering, Takeoff, Auto-rotation, Approach and Engine Shutdown. The film offers very detailed views of this classic "Chopper," inside and out. The U.S. Marine Corps H-1J and AH-1T SeaCobra helicopters are twin engined variants of the Army's AH-1G Huey Cobras, which had been introduced during the Vietnam War. The main difference between the H-1J and AH-1T is that the latter was specifically designed to carry TOW missiles. The Marine Cobras saw limited action at the end of the Vietnam War and then in in Grenada in 1983, the Gulf War, Afghanistan, and Operation Iraqi freedom.. nautical miles. They can reach speed of 170 knots , cruise at 140, have a range of 100 miles and are IFR equipped for all weather and night operations. They can mount a wide range of weapons, making them extremely versatile, include a chine mounted 3 barrel 20mm Gatling gun under the nose with 110' traverse, up to 52 rockets in four pods, four TOW missiles on each side, Fuel Air Explosives for clearing LZs & pods for carrying extra Gatling guns. The film shows Marine Cobras performing critical missions, mostly in support of amphibious landings, including: escorting transport helicopters to and to onshore operations, supressive fire for landings and follow up advances, escorting and scouting for armor, acting as forward air controllers and marking targets and attacking enemy armor. Cobras typically act in two ship formations, supporting each other in "pop up" attacks from behind cover, flying very low, aided by their extreme agility to follow rough terrain. I created this documentary from a reel of raw, silent & unedited film footage from the Vietnam War. My goal was to produce a video that reflects the likely intent of the original production team that shot the film. I have seen short snippets of this footage elsewhere, but as far as I know, it was never edited together as it is here. I added sound effects and music appropriate for the period and digitally color corrected the footage. This is not a "combat" video; it's a "slice of life" from the Vietnam War. Operation Double Eagle in late January, 1966, was the largest Marine amphibious assault since the Korean War and the largest conducted during the Vietnam War. 5,000 "Delta Force" marines from 1st Marines, 2nd Battalion, 3rd Marines, 2nd Battalion, 4th Marines, and 2nd Battalion, 9th Marines landed by ship and helicopter in southern Quang Ngai Province near Duc Pho. Great quality color footage shows USAF 20th Squadron "Jolly Green Giant" CH-3C helos operating out of Danang supporting the amphibious landing in a variety of roles including ferrying 105mm howitzers from "Red Beach" inland to forward fire bases, transporting causalities and captured VC, bringing in spare parts and ferrying civilians from the combat zone to safe havens. One of the iconic images from the War in Vietnam is of U.S army door gunners firing M-60 machine gun bursts from a low flying Huey into the jungle below. Originally, Hueys had three man crews, with one doing double duty a a door gunner, but it soon became apparent that adding a dedicated fourth crewman for that role had numerous benefits. Door Gunner trainees were volunteers. This fascinating film shows all aspects of door gunner duty, from training through deployment in front line units in Vietnam. And the film isn't just about these 'Shotgun Riders," it's also an informative look at all aspects of Huey Attack Helicopter operations & tactics in Vietnam. Training in Hawaii included firing an M-60 from a moving helicopter, weapons maintenance, visual search techniques, range estimation, leading targets from various altitudes, emergency 1st aid for combat casualties, jungle survival school and tree top maneuvers in Makua Valley. Then the action moves to deployment in Vietnam, from initial orientation through the first mission. Just some of what you'll see: mission briefings, various roles of Huey crewmen, pre & post flight checks, arming and disarming the chopper, evacuating wounded, fire support missions, securing an LZ, escorting transport helicopters, and various attack helicopter tactical formations for different missions. Often called "The Helicopter War," Vietnam produced an explosion in demand for trained pilots & crew. Starting with basic classroom work on aerodynamics, engineering & more at Fort Walters Training Center, promising students, mostly drawn from the Army's Warrant Officer training program, soon move on to to basic flight school with a civilian contractor pilot in the minuscule TH 155 trainer to learn basic flight controls & helicopter handling and then on to their first solo flight. (At any time, 400 choppers could be in the air at this facility!) Then a veteran military instructor takes over to teach them advances skills, including low level cross country flying, navigation, formation flying and recon work. Those that pass the test move on to the even bigger training facility at Ft. Rucker, Alabama for advanced training on the larger TH13T, including instruments, ADF and GCa. The next step up is to the ubiquitous Huey UH1, basically no different than the ones they'll fly in Vietnam or Europe and includes basic maintenance and familiarization with the Huey gunship variant. Training culminating in an 8 Day 'Field Problem," where everything is done to simulate operating in real combat conditions doing a variety of missions, including heavy lifting, recon, transport & LZ support. After a long and demanding winnowing process, the best candidates graduate and are assigned to units all over the World. From their inception Helicopters were seen as ideal carriers for transporting loads from Point A to Point B in remote, inaccessible areas in a relatively short time. The Army's Boeing CH-47 Chinook is a prime example that could lift up to 10,000 lbs. This nuts and bolts, how its done film shows an Army team airlifting a M54 forward air defense launcher, mounting four MIM-72A heat seeking missiles, in an emergency situation in the desert by decoupling it from it's tracked carrier and transporting it to a hot spot to provide a ready to go defensive shield. Bonus: World War Two Helicopters. (1941-45,B&W,Silent,10:00) These very rare archival film shows test flights of three of the first operational military helicopters in World War 2: the German twin rotor Focke Achgelis Fa 223 Drache (Dragon0, the German single rotor, forward engined Flettner FL265, and the American Vought Sikorsky VS 3000 Amphibious helicopter.